This colonial village will take you back to “Old Mexico,” as my mother would say. There are no modern buildings and most of the Colonial highlands atmosphere remains intact. There is a north and south entrance to Patzcuaro. Buses arrive from the north. The Hotel San Rafael on Plaza Grande is fastest from the north. From Morelia, take the cuota to Uruapan and the Patzcuaro exit. Turn right at the over-head CENTRO sign. To get to the Plaza Chica side of Patzcuaro, go straight at the circle. The Hotel Posada San Rafael on the Plaza Grande is my favorite place to stay. Parking was full at around 6 PM. I had never seen more than 4 or 6 cars and now there huge back lot with 50 spaces is full. Patzcuaro during the Christmas holidays is so different from the sleepy, colonial town in previous visits. And I thought Day of the Dead was crowded!!! Another difference are the visitors. For Day of the Dead, the few tourists were gringos. For the Christmas holidays, English was never heard, and most of the visitors were from Mexico City. Mexico's capital is empty, I have been told. Most of my gringo friends were gone. We arrived in Patzcuaro on Dia de los Inocentes, or Day of the Innocents, Mexico's April Fools Day. The date refers to the slaughter of male infants by King Herod in his attempt to kill the Baby Jesus. In Spanish, “innocent” can also mean naïve or foolish. Practical jokes prevail, with entire offices being fired or political rivals swearing devotion to each other. Gringos are usually spared this custom. The Hotel Mision San Manuel, next to my hotel, often has live music in their bar, El Campanario. LA CRUDA really rocked. There wasn't an empty table under the arcade. My margarita was perfect: no salt; no ice; and no sugar. For a town that “closes at 10 PM,” Tuesday night was happening. Patzcuaro was so crowded that breakfast was a problem. The restaurant at The Gran Hotel was packed, so I tried La Surtidora, on the west side of the Plaza Grande. They could not handle the crowd, but I was starved and had a newspaper to read. The Miami Herald now publishes The Herald in Mexico. It's not as good as the defunct Mexico City News, but nothing, even in the states, topped that paper! It wa not uncommon to have op-ed editorials by Paul Krugman, Maureen Dowd, and Molly Ivans, all on the same page. The eggs, bacon, and beans were served cold and arrived with the fruit plate, juice and coffee. The juice and fruit were OK and I should try this place again when not so busy. I broke my one rule of restaurants in Mexico: Never go to a restaurant when you are hungry. It's the Peter Principal that Hunger induces slow service. Busy restaurants are easy to understand, but cold food in Mexico is unusual and usually unforgivable. Located on the south side of the Plaza Chica, the cafe is a local favorite, especially among the gringos. The hotel room I saw was a small, cubicle with a dark window facing a wall. It could have been anywhere. Rooms are $450-single, $650-double, with parking several blocks away. Breakfast started with hot, frothing, café con leche, coffee with milk. The American coffee is also good. The combo breakfast started with fresh juice or fruit. I requested papaya and it was the freshest of the trip. Next arrived a basket of sliced bollio rolls, toasted to perfection and still hot. Whole wheat rolls are available. Eggs were scrambled with a side of half a dozen slices of crisp bacon. The refried beans were perfect. A bowl of mild, green sauce was served steaming. It is easy to see why this outdoor cafe is so popular. CASA KEY, Ibara Street, 1 1/2 blocks east from the NE corner of Plaza Grande. This popular Internet restaurant is owned and operated by two delightful young men. Daniel is from Tampa, FL and moved to Patzcuaro several years ago. Carlos is from Patzcuaro and learned perfect English living in Tampa. General manager, in charge of everything, is Baby, their Pomeranian. She is bilingual and will respond to requests in either English or Spanish. Just don't refer to her as a D-O-G.
For breakfast, our waitress informed us that they were serving chilaquiles, soft tortilla wedges sauteed in green chile sauce and sprinkled with cheese. Included was my choice of eggs, crisp bacon and fresh orange juice. Price was about $30, including Internet. Their ALL YOU CAN EAT Comida (lunch) (US$3.75) changes daily. I tried a little of everything and was pleased. There was a chicken breast stewed with onions and peppers; beef strips in gravy; pork chunks and crepes. Choice of vegetables were great with zucchini with corn and peppers, breaded cauliflower, refried beans, and Mexican rice. Another visit offered a squash casserole that was fantastic. Their speciality was the sauces. The meats included pork chops and pork roast in two different sauces, plus beef steak and chicken in green mole. Some local dishes were available, like coronas, a cheese-stuffed corn dumpling. The price included dessert: flan, cake, or ice cream. Everything was delicious. Comida begins a 1:30, and by 3:00 or so, thanks for a large local following, some items are gone. Arrive early and hungry, no problem for gringos. They serve until 6:30 PM. No visit to this area would be complete without a trip around the lake. This delightful experience can either be a few hours or an all day trip. Unique villages sprout every few miles and the views are breathtaking. Erongariquaro, (say “ah-wrong-ah-REEK-quah-row”) is about 10 miles from Patzcuaro. Taxis are about to US$10.00 each way, but taking local buses is more fun and cheaper. At the NE corner of the Plaza Chica, board any combi, a 10 passenger van, with ESTACION, or STATION painted on the front window. These combis are the local buses and go everywhere. They arrive about every 5 minutes and will take you to the old train station. In a few minutes, board the second class bus marked “Eronga.” Sit on the passenger side for the best views of the lake. If you are lucky to be visiting Michoacan in the rainy season, July through October, every field will be a riot of colors from the flowers. Crops of purple Cosmos or fields of orange marigolds will startle you into nirvana. “Eronga” is about 5 miles further if you want to visit a small lakeside village. Flag down any bus named “PATZ” for a ride back into town, but buses stop at 8 pm. Visitors to Lake Patzcuaro can see the entire area from his high, mountain, overlook. Patzcuaro is at the far right with the town extending down to Embarcadero at the Lake. In the middle of the vista is the famous island of Janitzo. To the left are the lakeside villages of Tocaro and Eronga. This is the layout of the Lake that no map can offer. Take Ponce Street, at the SW corner of the Plaza Grande, and go west. Carefully cross the very busy Periferico and start up the cobblestone road. At the fork in the road, go right and straight up. My drive took about 15 minutes, while the walk might take at least an hour, but probably longer. I noticed several bicyclists, but no one walking. A few were taking taxis. The entire experience was beautiful. The cobblestone road is lined with tall trees with trunks painted white. At the end of the road is a large gazebo and the parking area with the views. It wasn't the summit. Behind the picnic area were 447 steps going straight up the mountain to the top observation point. I will have to save that for my next visit. First Published in El Tope, 2003, monthly English newspaper in Patzcuaro. In 1572 Bishop Quiroga rescued the Purépecha people of Michoacán from the worst of Spanish oppression and created his vision of Utopia with crafts communities around Lake Pátzcuaro. He wanted the Purépecha to be self-sufficient and did so by allotting a different craft to different villages. Many of these cooperatives are still creating today. Quiroga assigned the craft of metalsmithing to the indigenous people in the hills around Santa Clara del Cobre. These were the only native people allowed to work with metal, and they were not permitted to make swords, knives, or guns. Today Santa Clara del Cobre remains a world-class center of copperware. The people of Erongarícuaro were taught weaving and still produce a finely woven cotton linen. They also perfected the art of "drawn fabric," or "cut fabric," where the woof threads are removed and the longer, warp threads are drawn together and tied into interesting designs. Intricate embroidery has been added to this fabric. Ceramics were made on the shores of Lake Pátzcuaro in the village of Tzintzuntzan. In today's market, a collector of crafts will still find ceramics, but mostly find woven reed handicrafts such as baskets, mobiles, figures, and decorations for every holiday. These are lightweight, so a big sack of these reed crafts makes a lightweight, carry-on. The craft of carving ceremonial masks was bestowed on the village of Tócuaro, on the road to Erongarícuaro. Juan Orta Castillo has won the prestigious National Mask Maker award several times, as have several of the other mask makers in the village. There are no signs on the home/studios of these artisans, nor are there street signs. Castillo lives on the street with the bus station and the church. Everyone is friendly and will gladly point you to the correct door. Uruapan's artisans are famous for their gleaming cedar lacquerware known as maque, especially the boxes and trays. Inside the city limits is the Parque Nacional Eduardo Ruíz, a jungle park full of beautiful gravity-driven fountains spraying water into the air. At the entrance is the restaurant Plaza Uraní with its famous complementary appetizer tray. Try their fresh trout Michoacán, which is covered with chopped macadamia nuts and lightly sautéed in butterall this with a great view of the park. The town of Quiroga is known for its woodcarvings. The village of Cuanajo creates hand-carved pine furniture. 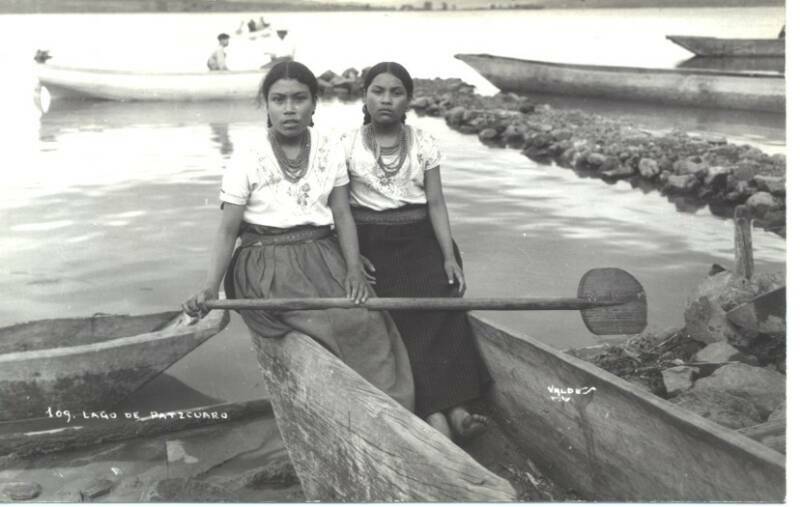 The people of Ihuátzio, a lakeside village, weave tule, the reed that grows on the side of Lake Pátzcuaro. Fine china is made in Patamban, and exquisite guitars are crafted in Paracho. There is even a hat factory in the tiny village of Jarácuaro. All these villages are easily accessed from Pátzcuaro. The shores of Lake Pátzcuaro are the home to one of the major craft complexes in the Americas, and the vision of Quiroga remains alive in Pátzcuaro, the commercial hub of his village utopias, attracting buyers and collectors from all over the world.